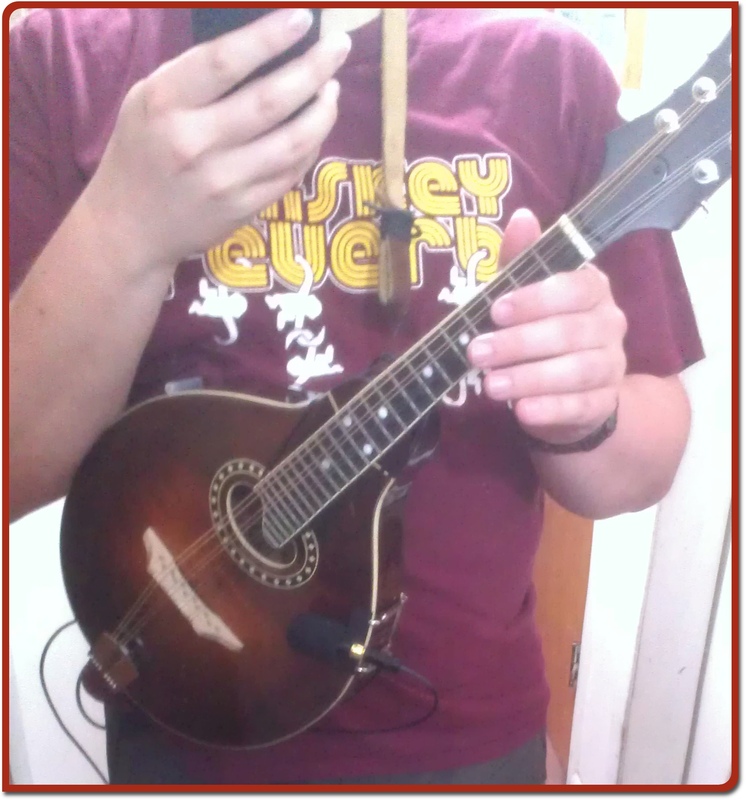 My Naiant X-R mandolin mic just came in the mail! Here’s a quick overview, a lot of pictures, and some sound files. 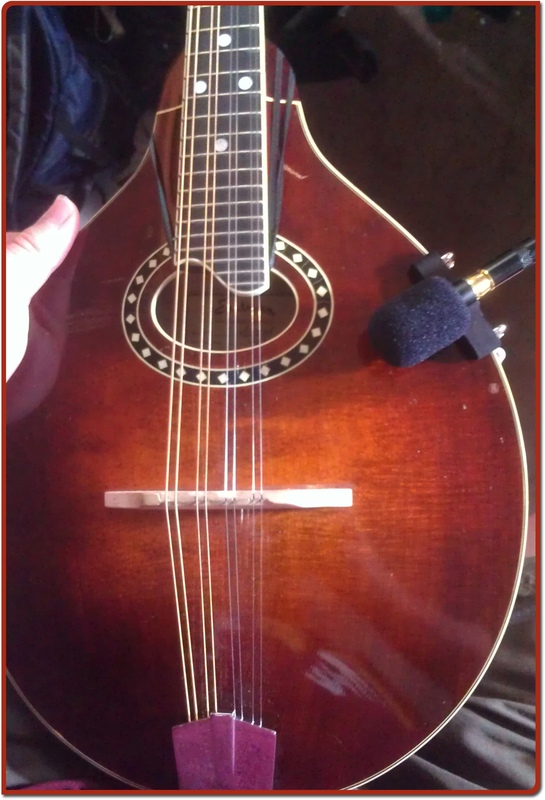 Mandolins are challenging to mic for live sound/stage performance. They’re pretty quiet as acoustic instruments go, so they don’t put out a lot of signal. They also have resonating sound boxes that pick up and amplify feedback frustratingly well. In combination, these factors often make mandolins into feedback nightmares on stage, especially in challenging amplification situations like where Frost and Fire often finds itself. I’ve had several gigs where I had to stop playing mandolin because the sound tech couldn’t stop the feedback. It seems as though the mandolin world doesn’t have a “go to” mic setup that everyone likes. Some people prefer playing into a Shure SM57 on a stand, some like acoustic transducers glued to the soundboard, there’s a Fishman piezoelectric bridge you can try, some like onboard mics… you name it, there are people advocating it. I’ve been using a Naiant X-X omnidirectional condenser mic on my wooden flute for a year or so, and I love it. Good signal, great tone, easy to use. And at $44, the price was right. I decided to contact Naiant’s proprietor, Jon, to see about mandolin mics. 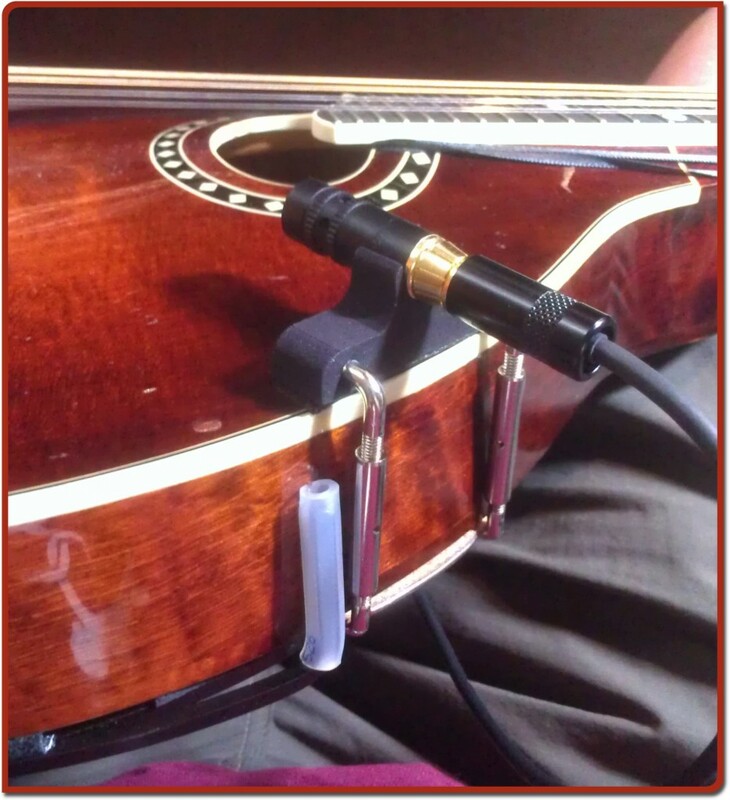 After some emails back and forth, I decided to try one of his Naiant X-R mics for the mandolin. The X-R is a really versatile mic system, and I encourage you to check his site to read more about it. 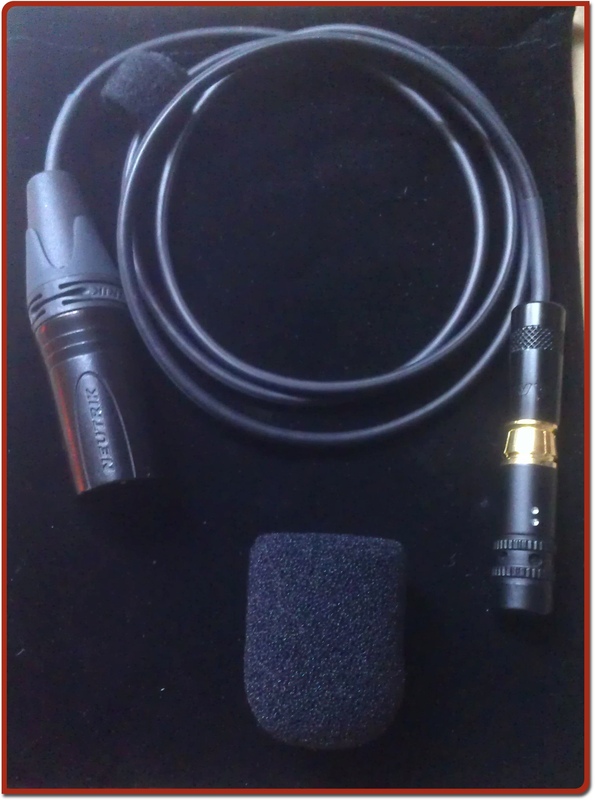 I ordered the remote mount (which puts the mic at the opposite end of a thin cable from the XLR connector) and the hypercardioid capsule (also available in cardioid, cardioid low-sensitivity, nearfield cardioid, omnidirectional, and omnidirectional low-sensitivity options). 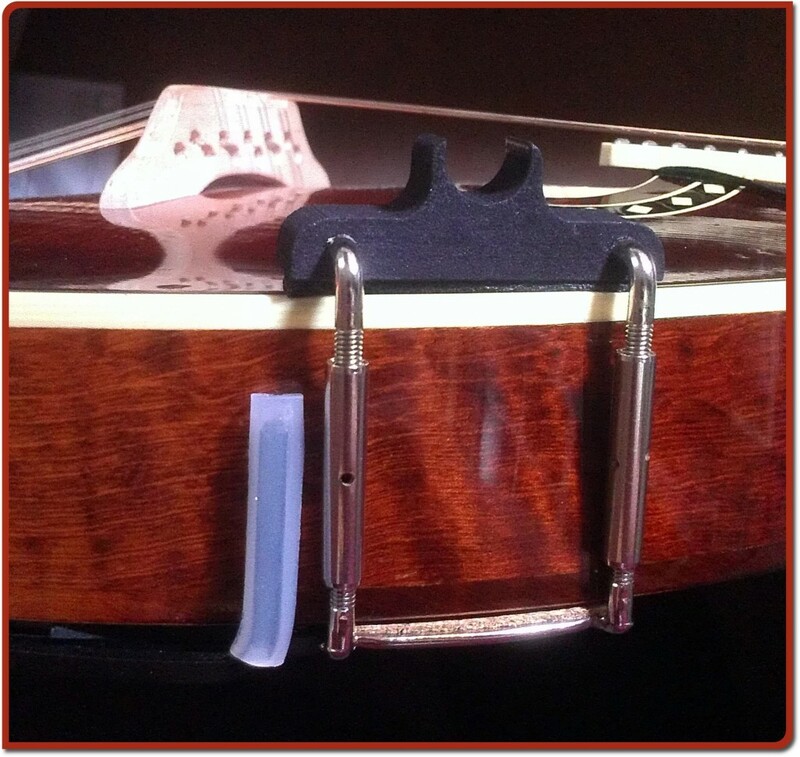 I added the viola/mandolin mounting bracket, and the whole setup cost $125.80 USD after shipping. I picked the hypercardioid capsule reasoning that its highly directional pickup pattern would help to isolate the mandolin from other sound sources on stage, maximizing the signal-to-noise ratio for this quiet instrument and helping to prevent feedback. There can be a degradation in purity of sound with hypercardioid mics (at least, some people think so), but I was willing to take that chance if it let me play without feedback. As it happens, I really like the tone of the mic. I haven’t had it in a stage environment yet, but I’m excited. If you take a look at the picture above, you’ll see that the X-R comes in several pieces. 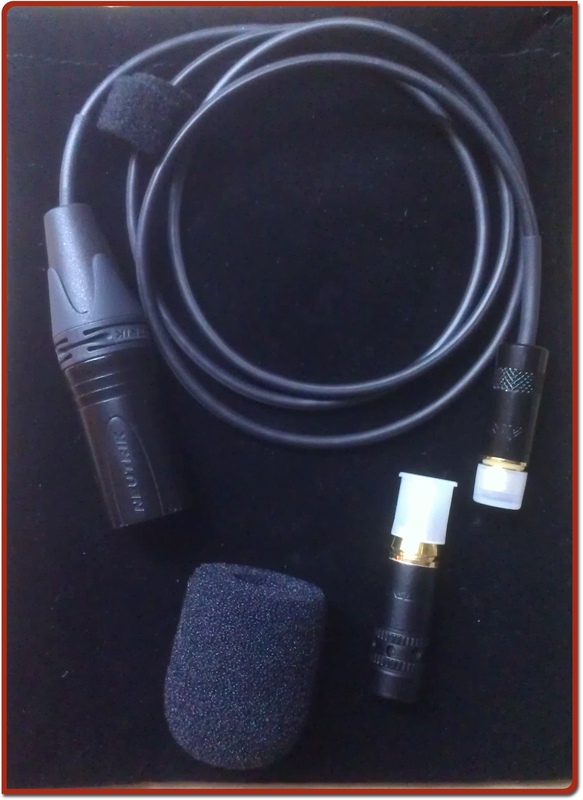 The cable that’s connected to the large XLR connector is called the “remote mount”, and the smaller piece at the bottom right is the microphone capsule. There’s also a foam windscreen included in the package, and the whole thing comes in a nice velour bag. The remote mount and the mic capsules connect to each other with gold-plated RCA plugs, which are a clever way of allowing a single amplification circuit to work with a variety of Naiant capsule options. Swapping them out is easy and quick; if I wanted to, I could order an omnidirectional capsule and have this mic do double duty between mandolin and flute. Here’s the system with remote mount and capsule connected. I ordered the viola/mandolin mounting bracket, which is similar to the standard “carpenter jack” mounting brackets used by many fiddle players. There’s a top (black) apart that holds the mic with a friction fit, and then the rest is a clamp with two turnbuckle-style screws for adjusting the fit. The bracket appears to be 3D printed out of some form of plastic, with foam on the bottom surface and cork facings on the metal parts. I was initially concerned that the bracket might not fit given that my mandolin (an Eastman MD-504) has a Tone-Gard attached to its back. The Tone-Gard does make the placement a bit more tricky, but I found that it was still possible to attach the bracket in several places. If you imagine the mandolin standing straight up with the neck pointing up toward 12 o’clock, I tried the mic at 1:00, 1:30, and 4:00. 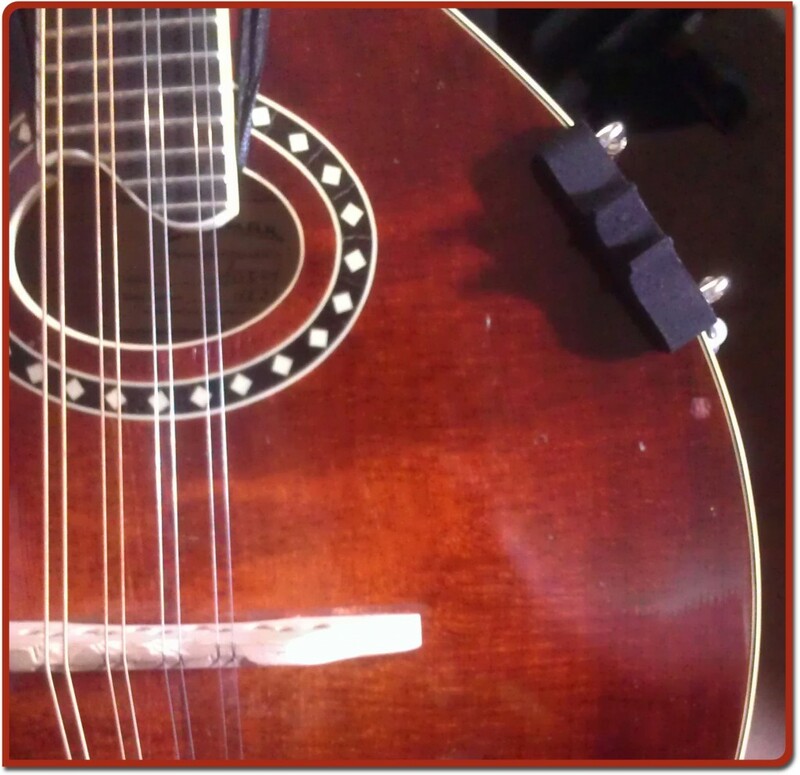 My friend Jeff has written about mic placement on mandolins, and you might find his work interesting. You can get quite a range of different sounds depending on how you position the mic. And a side view, showing the turnbuckle-style screws and the proximity to the Tone-Gard’s plastic-covered attachment (the vertical white thing to the left of the bracket). Again, there is foam or cork protecting the bearing surfaces, so I don’t expect to have problems with the finish on the instrument. Here’s the mic installed, without the windscreen attached. And here’s the mic with the foam windscreen attached. I plan to play with the windscreen on, partly because the dances I play often have fans and breezy windows, but also because the windscreen will provide a gentle “early warning” if I’m getting close to hitting the mic with my picking hand. I haven’t found that I hit the mic with my picking hand when the mic is mounted in either the 1:30 or 4:00 positions. I did hit it with the mic mounted at 1:00. With the whole instrument in view, the mic remains fairly unobtrusive even with the large windscreen in place. If I were concerned about the look, I could just leave off the windscreen. This is an Eastman MD-504 oval hole mandolin with a maple 11-hole bridge that I made from scratch. I’m playing with a Dunlop Primetone 3mm sculpted pick; to hear the instrument with other picks, check out the huge pick comparison article I did. These are quick-and-dirty recordings right after work. The signal path is the Naiant X-R hypercardioid into a Presonus Firestudio Mobile into REAPER64 running on a MacBook Pro with Retina. After rendering each take, I ran them all through MP3Gain Express to set them to a nominal level of 89 dB. Other than adjusting volume, none of the tracks have any sound processing. 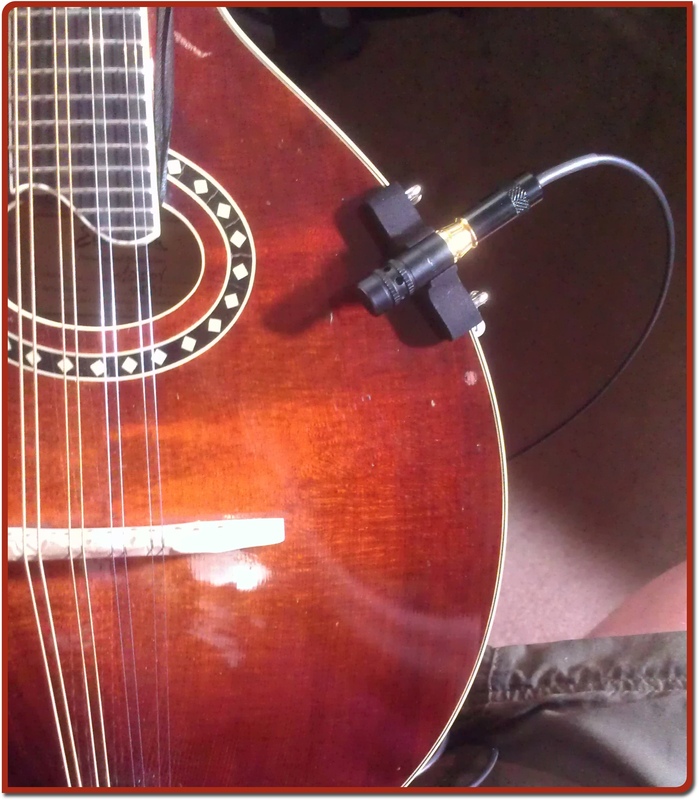 In my mandolin picks comparison, I used a K&K Silver Bullet through a Shure X2U interface. I played my jig tune, Equinox, for all of those samples, and thought it would be good to compare the sound of the K&K Silver Bullet to the sound of the Naiant X-R hypercardioid. The whole setup, with its bracket, fits easily within my mandolin case. It’s possible to leave the mounting bracket on when you’re not using it, but I’ll probably take it off just to protect it from accidental damage or loss. If you decide to order one of these mics based on my report, say hi to Jon for me! By request, I tested how the mic responded to RF interference from being placed next to a cell phone that was transmitting data. So far, I really like the mic. I prefer the 1:30 mic position. What do you think? Tell me in the comments.